Our March 2019 Employee of the Month is Charles Koch—the Koch brother who remains politically active following the retirement of his younger brother David last year. The Koch brothers are paragons of the new American feudalism, who turned pillaging the commons for personal enrichment into a doctrine for societal misgovernment and planetary recklessness under the banner of libertarianism and free markets. 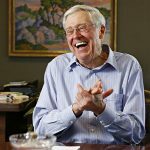 Charles and David Koch each have a personal net worth of over $50 billion—making them among the richest people in America—but their influence has far exceeded their personal wealth. Utilizing a network of private donors to promote their favored causes, they have marketized America’s political sphere like no others. The Koch brothers are not the only culprits in turning American democracy into a political marketplace. There are many other political financiers, including ardent Democrats. But even if there were a “balance” between the plutocratic political spending on each side of the political aisle (and there isn’t), the resulting high cost of conducting politics serves as a huge barrier to the entry of the less wealthy into the political arena. The transformation of democracy into oligarchy, of elections into auctions, means that those opposing the radical right agenda need to find their own ultra-wealthy financial patrons—a bargain that comes with its own perils. Over the decades, the Koch brothers and their network of wealthy donors played a crucial role in shifting the Republican Party towards the libertarian far right, and thus paved the way for the election of candidates who espouse positions that would have been considered off the political spectrum in a previous generation. Their legacies include the Tea Party and the Trump presidency. The Koch brothers quietly declined to endorse Donald Trump in 2016 and again in 2018, probably because they feared that his vulgar populism imperiled their agenda. But without the shift in America’s political terrain so persistently engineered by the Koch’s, his candidacy would likely never have happened. Today, Charles Koch is distancing himself from his increasingly toxic public image, and promising to fund a broader array of causes, including longstanding agendas of social liberalism such as education, immigrants’ rights and prison reform. It is welcome to have libertarians converging with liberals on these issues, as their common approach can emancipate people—including the poor and minorities—from bad policies. Similarly, it has been good to see the Kochs supporting foreign policy and security policies that discourage military interventionism and promote an open global order. But, caveat emptor: social liberals and liberal internationalists shouldn’t think that this tiger is shedding its claws. The Koch brand isn’t going to drift away from plutocratic libertarianism and the agenda of corporations running the world. Charles and David Koch were born into America’s gilded class, inheriting a fortune built in part through their father Fred’s investments in Nazi Germany and Stalin’s USSR. Today the octogenarian siblings have de facto established their own political vanguard, a secretive structure with tentacles that have touched almost every organ of government and which has consumed the Republican Party from within. The Koch brothers have kept a carefully-judged distance from Donald Trump as both candidate and president, but his cabinet contains several of their closest protégés (Vice President Mike Pence, Secretary of State Mike Pompeo, Education Secretary Betsy DeVos) while the EPA is busy pursuing the Koch agenda of reducing the natural environment to a despoilers’ sand box. Experts at gaming the tax and environmental regulations for corporate profit, and accomplished practitioners of bullying critics, the Koch brothers found that these skillsets enabled them to game the American political system, to even more gargantuan financial returns. The “Koch method” of profiting in the oil business included fixing the meters and gauges so that taxable production would be under-reported, improperly extracting oil from Native American reservations, persistent pollution, and intimidating all those who challenged their infractions. Possibly, their discomfort with the Trump candidacy was that they worried that it would expose the resemblance of the Trump Organization to a criminal syndicate, and with that the double standards of so many leading corporations. Dreams such as this animate the Koch brothers’ network. But in the meantime, political allegiances are geared to commercial expedience. As the brothers and their network tried to reach escape velocity from the humdrum law of political gravity, a lot of fuel had to be burned. One of the loopholes the Kochs exploited, possibly serendipitously at first, was the tax exemption of not-for-profit foundations. This allows the wealthy to contribute to philanthropic institutions and deduct taxes on those contributions. Tax breaks for charitable purposes can promote public goods such as the arts or conservation of nature, sponsoring medical research or promoting world peace. Over the century since the creation of tax exemptions for private philanthropic foundations, vast funds have been allocated to these sorts of activities. However, foundations can also be used to promote causes that favor the private interests of their sponsors. If those interests are confined to a particular school of art or a particular wildlife refuge, then it is arguable that public is subsidizing the private preferences of the wealthy. Much more serious is when tax-deductible dollars are used to advancing causes that bring enormous private benefits to the benefactor—such as promoting the ideology that government should not raise taxes, invest in public goods, regulate private industry, or limit fossil fuel use. Ultimately this reduces political power to a commodity: to be manufactured, marketed, bought and sold; the ultimate triumph of the market over democracy and reasoned deliberation. The “Kochtopus” includes think tanks, supporting charlatans intent on inverting the enlightenment maxim that evidence should guide policy. They have been hyperactive in discrediting scientific expertise—an ethos that is exceptionally irresponsible when it comes to matters of planetary survival. Its tentacles incubate law curricula that elevate the privileges of the owners of capital to a fundamental constitutional right. It has manufactured fake grassroots (“astroturf”) movements, that masquerade as popular causes. Groups such as Americans For Prosperity pursue deeply partisan agendas under the guise of liberty and public interest. Finally, the tentacles have grasped hold of campaigns for political office—and against anyone who is elected who supports contrary policies. The Koch brothers were determined that President Obama should not be able to enact the policy pledges that won him electoral victory. They campaigned against the Affordable Care Act, against environmental protections and policies to reduce greenhouse gases, and a raft of other measures. One of their signal victories was the 2010 Citizens United ruling by the Supreme Court, which notoriously unleashed even vaster sums of anonymous money into political campaigning. Fears that the U.S. was fast turning into an oligarchy, in which those who owned the nation’s biggest private fortunes also owned the machinery of government—legislature, executive and judiciary, at all levels—are amply justified. Charles Koch is now repositioning himself as a patron of (some) centrist causes. We shouldn’t see this as the “moderation” of the Koch agenda, but instead as the incipient mercenarization of those selected issues. Only if Koch were to lend his name and network to a campaign for a decent global tax system—for example by funding groups such as the Tax Justice Network—would we have reason to take this shift at face value. For his role in parasitizing America’s free market economy and poisoning its democracy and rule of law, our March Employee of the Month is Charles Koch. One of whom was editor of The Times of London, owned by Rupert Murdoch, and is father of the English politician and hardline Brexiteer, Jacob Rees-Mogg. The benefactor of the World Peace Foundation, Edwin Ginn, was one of the very first to make use of this legislation in Massachusetts in 1910.